We first met Chef Ricardo back in 2013 at The Pepper Market in Disney’s Coronado Springs resort. Later, as many chefs do, he moved on, landing at Cabana Bay Resort (with Chef Paul and other former Disney Chefs) and continued to take excellent care of us and others with food allergies. Well, look who we ran into at Disney’s Grand Floridian resort! 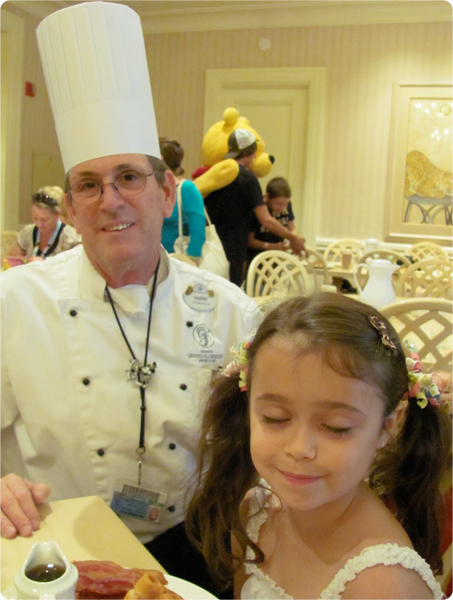 He works in the kitchen that serves 1900 Park Fare, The Grand Floridian Cafe and Gasparilla Island Grill. Stop by either and, if you ask for the chef, you might find Chef Ricardo, who will take great care of you. P.S. We stopped in at Cabana Bay Resort two days later and caught up with Chef Paul! This quick review was provided by Vanessa, whose son is allergic to peanuts, tree nuts, egg, and milk. 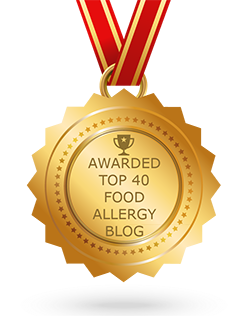 As a mother of a child with many allergies it’s always scary eating out, any where you are. Disney REALLY takes most of that fear away. We were so pleasantly surprised at how accommodating the staff was and how knowledgeable the chef was of food allergies. The chef came to our table and took me and my son around the buffet and cautioned us against certain foods and assured us of allergy free foods. They even went the extra mile and brought over a custom allergy free dessert. 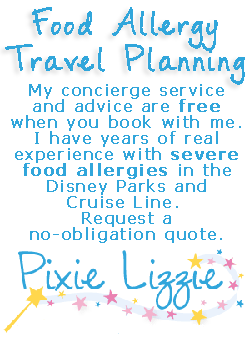 Love Disney and their exceptional service! 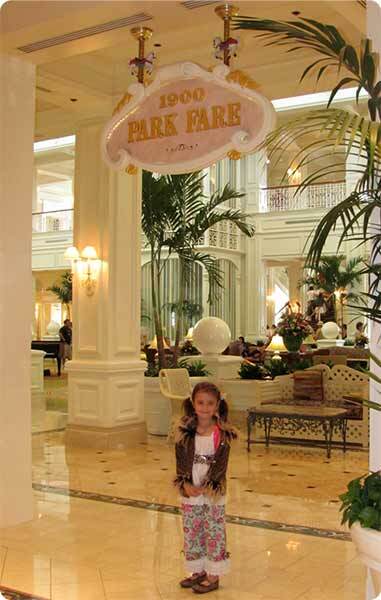 If you would like to review 1900 Park Fare or any Disney restaurant, submit a food allergy dining Quick Review. 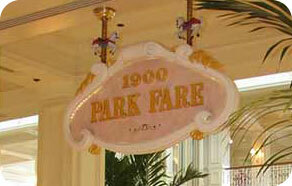 1900 Park Fare offers a wonderful breakfast buffet in the Grand Floridian Resort. The Supercalifragilistic Breakfast includes the following characters: Mary Poppins, Alice in Wonderland, the Mad Hatter, and other Wonderland friends. On they day we dined there, we found Winnie the Pooh and Tigger, too. We had our photo take by a professional photographer before being seated. This is delivered to your table to preview, and is available to purchase. Upon checking in, we reminded the maitre d’ about our daughter’s food allergy and they noted this on our seating ticket. Once we were seated, we reminded our waitress and she called for the chef to visit our table. We informed the chef and he assured us that her meal would be prepared carefully in the kitchen, free of any possibility of cross-contamination. With our daughter’s severe dairy allergy, we never allow her to eat from the buffet. Ever. The chef prepared dairy-free and gluten-free waffles with maple syrup, crispy bacon and scrambled eggs. She also had fresh fruit, which she really enjoyed and was able to select herself. She chose watermelon, strawberries and grapes. The waitress also brought her a special Tinker Bell toy for her water, that clips to the straw and lights up. This is another example of getting special treatment at Disney when your child has food allergies. There was a girl next to our table who pleaded with her mother get her one. She told her daughter that our daughter couldn’t eat everything, including the desert, so the staff wanted to make up for that. She felt better, but it reminded me of the “no you can’ts” that our children hear everyday — probably several times a day. We big kids ate omelets from the omelet station and grits — yes they had grits! We also had french toast, fresh fruit, eggs, pancakes and bacon. In my opinion, this was the best breakfast at Disney. The characters spend lots of time at your table for signatures, photos and to goof around. 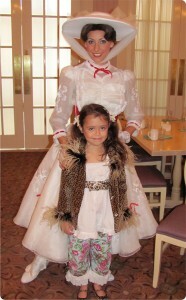 Alice was a real “character” trying on our 6-year-old daughter’s leopard and feather jacket. She exclaimed, “Oh I want that jacket, let me try it on” and did! She was really funny and just like the fairy tale character. Tigger remained even as guest were leaving, and kept bouncing around from table to table. 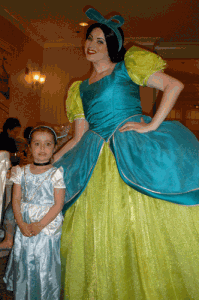 This experience ties Akershus for 1st place for Character Dining, especially for breakfast. It was “Practically perfect in every way!” Thanks, Chef Harry! If you’ve dined at 1900 Park Fare with a food allergy, please comment below and share your experience with others. Or, send it to us and we will post it. 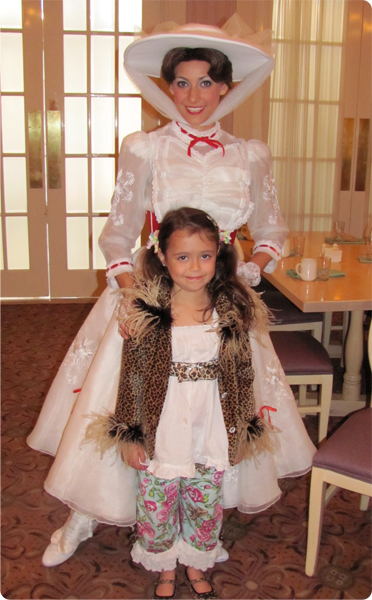 Located in the Grand Floridian Resort, this is a great Character Dining event, if you’re there for the characters. 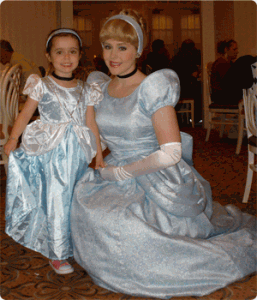 We attended the Cinderella’s Happily Ever After Dinner. As a buffet, it was “fair” for dinner. It included a wide variety of items, including steak, chicken, vegetables, salad, pasta and pizza. Of course, our daughter, having a dairy allergy, did not eat from the buffet. As we arrived, we confirmed that the hostess had our allergy information from our reservation. She relayed this to our server, and we further discussed the allergy with her. Our waitress requested the chef, who then walked us through the buffet. Since the buffet had a lot of cheese items, and the room was filled to the brim with kids waiting to see Cinderella, Prince Charming and friends, we felt that cross contamination was certainly occurring and requested the chef prepare something fresh. He was more than happy to oblige, and we decided on allergy free chicken fingers, french fries, fruite and a salad. 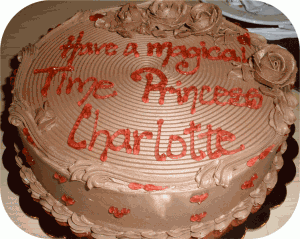 This dining event was early in our trip, so we chose to have a dairy free cake delivered for dessert, as we did for Cinderella’s Royal Table later that year. Therefore, we didn’t have dessert from the buffet either, though there were a lot of choices. 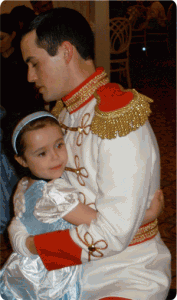 But again, the best part of the event was meeting Cinderella and Prince Charming. 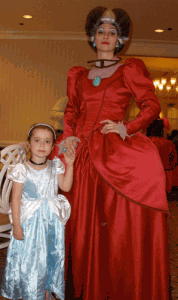 However, Cinderella’s step-mother, Lady Tremaine, and step-sisters, Anastasia and Drizella, nearly stole the show. They were hilarious! Incidentally, you can also catch them outside the Cinderella’s Castle, where they also put on a really funny show. 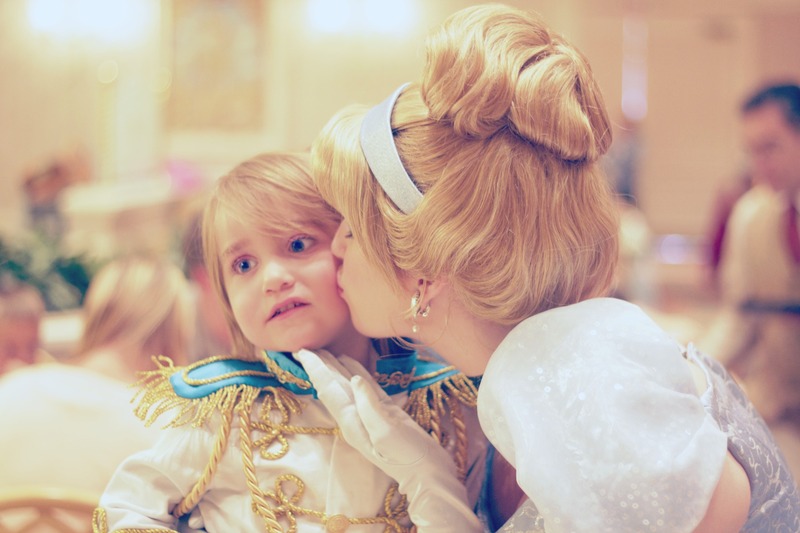 But this is one of the only places to meet Prince Charming. 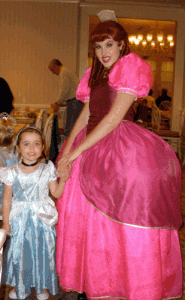 The breakfast and lunch events at 1900 Park Fare feature the characters from Alice in Wonderland and are known as the Supercalifragilistic Breakfast and the Wonderland Tea Party, respectively. Another fun part of the evening was before dinner. While waiting in the lobby of the Grand Floridian for your reservation, a crowd of little Princesses and their parents fill the lobby. 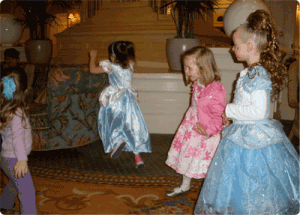 A pianist plays and the Princess eventually gather, and sometimes dance. This has become a tradition of ours. We order this dairy free cake early in our trip, so that we can have an allergy free desert every night of the trip — and sometimes for breakfast. Allergen free cakes are available at most table service restaurants, with a 7 day notice. Call (407) 827-2253 for details and to order. UPDATE: BabyCakes NYC in Downtown Disney now delivers allergen free and vegan cakes to most table service restaurants. Call (407) 938-9044 for details. A wide range of flavors and options available. A minimum 7 day notice is requested.